BSC Business Services Consulting Inc.
BSC Business Systems Consulting Inc. specializes in software application development and implementation for corporate clients. BSC assists organizations in realizing greater efficiencies in business operations through implementation of new technologies. BSC Business Systems Consulting Inc. has business and technology experience in a wide range of public and private sector corporations including, telecommunications, utilities, education, health care, agriculture, financials and insurance. 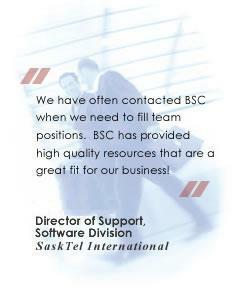 BSC has achieved the desired results on many IT projects it has been involved with because of its highly skilled, motivated and dedicated professional staff. BSC Business Systems Consulting Inc. has demonstrated the commitment required to ensure the success of IT projects. This experience and knowledge plays a vital role in the successful completion of current and future projects for our clients.